Labelled ‘the father of history’ by Cicero and ‘the father of lies’ by Plutarch, Herodotus makes for one of the most intriguing writers of the ancient world. 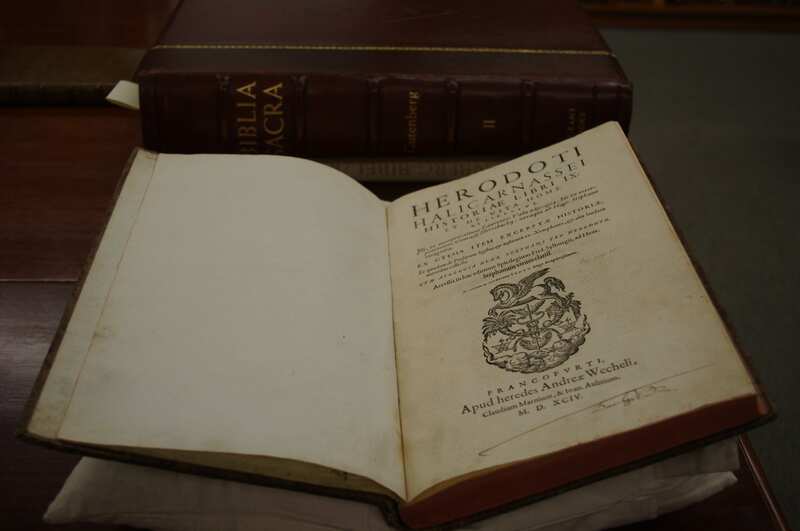 Herodotus, “Histories” is part of the Rare Books Collection. This is a 1594 Latin edition. Born in Halicarnassus in the 5th century BCE, Herodotus wrote the first narrative history, attempting to ensure “that things done by man” would “not be forgotten in time” (Hdt. 1.1.0). Herodotus’s Histories, organised into nine books, covers the years 650-497 BCE and notably explores the Greco-Persian wars. Herodotus was interested in the cause of the animosity between the Greeks and Persians, and used critical inquiry when retelling the past to attempt to find it. The Library’s Rare Books Collection contains a 1594 volume of Histories, translated by Lorenzo Valla and printed in Frankfurt. While Herodotus’ work is the key focus of the volume, it also features Conrad Heresbach’s translation of the Life of Homer. This biography of Homer was written by what is now recognised as Pseudo-Herodotus, and was probably created in early Christian times. The link between Herodotus and Homer is interesting, one being the father of history, and the other the father of epic storytelling. One might consider the distinction between the two, and how in the ancient times, with the absence of true scientific method, they were not as different as they are today. The tome also includes excerpts from Ctesias, Xenophon and other key authors from antiquity who wrote about the Persians. Finally, the volume features an apology on behalf of Herodotus written by Henricus Stephanus, who is most likely Henri Estienne, a 16th century classical scholar. The volume is in Latin. It does not have its original binding, but rather, a board cover with an attached label reading “Herodotus” on the spine, possibly from the original binding. The text block is a now-faded red colour. Otherwise it is in good condition, with sepia-coloured signs of age along the edges of the pages, which are very thin. The typography is Roman typeface, with illustrated capital letters at the beginning of the page to mark important passages. Further, the illustrated letters are in drop cap, running several lines deep into the paragraph. This allows the left margin and top margin to remain level. The first letter of the normal sized text is also capitalised, a typical typographical feature of the times. For those studying Latin, the tome would be an interesting source for comparison with other translations. Moreover, this volume allows us to learn about the 15th century art of book making, with the specific typeface and page layout. As a student of Ancient History, there is much to appreciate about Herodotus’s endeavours to tell history in a holistic way, trying to explain the cause and effects of its events. Despite his bias, without Herodotus the study of history would not be what it is today. Finally, whether Herodotus is telling the truth or not, one cannot deny his ability to entertain. The Editors of Encyclopaedia Britannica, ‘Herodotus’, Encyclopaedia Britannica (2018). Thanks to Dr James Chong-Gossard and Dr Andrew Turner for their assistance with translation. 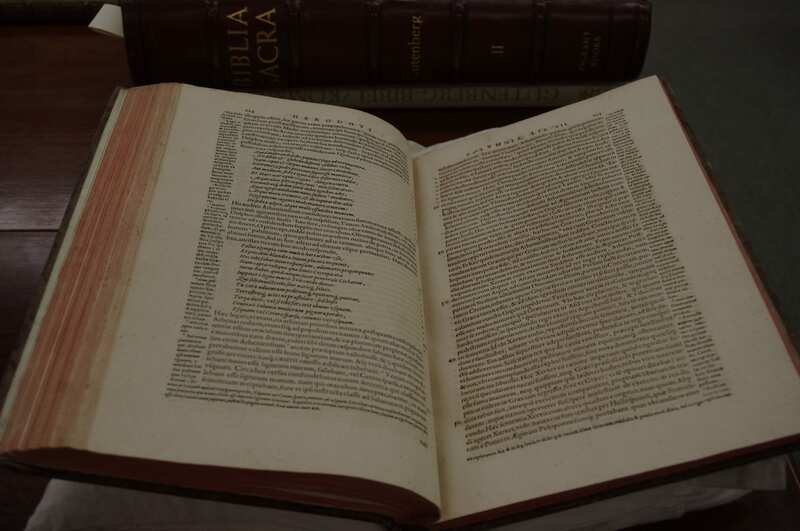 Previous Previous post: The Rare Books Collection: How did it all start?